When I was younger, I longed to sit down and play a role playing game. I read a lot of Forgotten Realms(1) novels, and I hungered to explore the setting with a group of friends. What could be more fun than sharing an adventure even if it were only in our heads? After all, that’s the true brilliance of cooperative role playing games. You’ve all got a finger or two on the Ouija planchette, directing where the story will go next. Even at its most basic, with just pen and paper, an entire world springs into being. Each player may envision that world differently but, in doing so, they’re taking part in the delusion. Unfortunately, that never happened for me as a kid. Gaming can be expensive and groups can be exclusive. Since becoming an adult, I’ve made my own path into the pen and paper world. The first time I sat down to DM(2) a game of Dungeons & Dragons I felt ill-prepared despite my copious research. I’d combed through the Internet for advice, printed cheat sheets, and prepped the dice, the snacks, and the manuals. I had pens and pencils, blank character sheets, and character sheet examples. I read through most of the premade campaign even though the hardback tome was intimidatingly large. In essence, I was overly prepared. Months later, I still wouldn’t call myself an experienced DM. I’ve since run campaigns other than Dungeons & Dragons, but I’ve found the essential elements between different role playing games are the same. A DM is only as good as her players. It may be the DM’s job to present the story, the side characters, the overall plot, but it’s the players that decide the goals. A DM needs to present the hook, the reason the players want to invest in the story. If your players don’t care about why they’ve been asked to save the mystical town of Hobblegoblin(3), then they’re probably just going to murder everyone that stands in their way. Instead of being motivated to investigate the town, get to know its people, they’ll be motivated by sweet, sweet experience points. Or gold. Who wouldn’t want gold? A good DM will motivate the players to buy into the story and, once convinced to care, the players will drive the adventure forward. Of course, they don’t always go where you (the DM) expects, but that’s half the fun. A few of my players really enjoy a good fight(4), so I found a short campaign involving a town with a tomb problem. People were dying after a special artifact had been stolen, and the town needed heroes to go into the tomb and kill whatever was down there. I fully expected them to eviscerate everything in their path. Instead, my players empathized with the creatures in the tomb. They went through the whole exploration phase without killing anyone. They returned the stolen artifact to the heart of the crypt. They talked down the angry spirit that was hell-bent on destroying the town. They didn’t expect that it was possible. They were fully prepared for a final fight, waiting for the spirit to turn on them, not sure that the artifact would appease the spirit’s thirst for vengeance. In essence, they bought into the delusion I’d spun. Despite knowing how the adventure was going to end, I was on the edge of my seat. Looking back now, I don’t really remember how that first session of Dungeons & Dragons went. Was I a good DM? Did my players enjoy themselves? I probably wasn’t, but I do believe they enjoyed themselves. As with most things, experience makes you better. I’ve learned important storytelling lessons from DMing and from being a player. 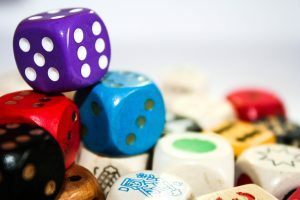 But if you have barriers (time, money, finding people to play with) that prevent you from sitting down at a table with a group of friends, there are other ways you can experience the shared delusion of role playing games5. One of my favorite podcasts is The Adventure Zone where three brothers (the McElroy’s) and their dad play Dungeons & Dragons. I’ve learned a lot from Griffin McElroy about storytelling, and the narrative he spins is frequently hilarious but also brutally heartwrenching. People may say it’s just a podcast6, but once you buy into the characters and their journey, you’ll be inside the delusion. (1) The Forgotten Realms are a campaign setting for Dungeons & Dragons. My favorite author was Elaine Cunningham, but I also devoured much of R.A. Salvatore’s work. (2) Dungeon Master, also known as a Game Master or facilitator of events. Largely a storyteller, the DM introduces the narrative and acts as a referee to wrangle player interactions. The DM also voices all NPCs (non-player characters). (3) Not the actual name of a town I’ve ever used, honest. (4) This is such a true fact, one of my players has attacked a party member in an effort to “get to the action” faster. This, of course, devolved into an entire meet up that dealt with the fallout from that encounter. Two characters ended up exploring a hideout while the other two luxuriated in a spa. (5)With the recent resurgence of D&D into popular culture, role playing games can be found in a wide cross section of media. Stranger Things used D&D to explain and describe the fantasy elements in their town. Ultimately, D&D became a shared language between the characters. (6)Podcasts are amazing and help pass the time on a commute. Other D&D podcasts include the Nerd Poker, Critical Hit, Friends at the Table, Drunks and Dragons, Acquisitions Incorporated, and probably many, many more. Tacoma served ten years in the military and has the smallpox scar to prove it. Her fiction has appeared in Devilfish Review, Crossed Genres, and Pedal Zombies: Thirteen Feminist Bicycle Science Fiction Stories. She’s currently a MFA candidate and you can find her forgetting to tweet @TMTomilson.